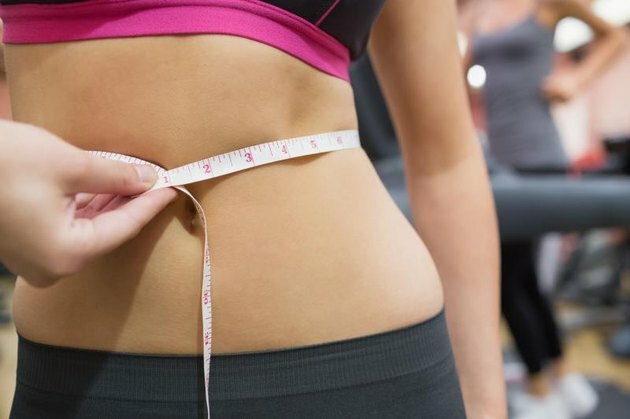 Belly fat is not only bad for fitting into your skinny jeans, it can be downright dangerous. Visceral fat, also known as intra-abdominal adipose tissue or belly fat, has been associated with type 2 Diabetes, metabolic syndrome and cardiovascular disease. Visceral fat has also been found to have a direct correlation to higher bad cholesterol and lower good cholesterol as well as insulin resistance. While visceral fat has been linked to many detrimental diseases, the great part about it is that it responds to diet and exercise. According to a recent study performed by the Journal of Sports Medicine & Physical Fitness, individuals who performed high intensity interval training -- or HIIT -- workouts over an eight week period lost more weight, more inches around their waists and a greater amount of belly fat compared to steady-state exercisers. People who perform HIIT workouts, which involve short periods of all-out exertion followed by a short rest period, are more likely to lose a higher percentage of body fat compared to steady-state exercisers. A study performed by the International Journal of Obesity found that women who performed 60 repeats of 8-second sprints three times per week for 15 weeks burned six times more body fat than those who did 40 minutes of steady-state cardio at these sessions. Not only did they burn more fat than steady-state exercise, but the HIIT exercisers did it in less time. Between carpooling soccer practice, your morning commute, and getting dinner on the table on time, there is barely any time to get to the gym. While dinner is in the oven and the kids are doing their homework, take 10 minutes out of your day to burn the fat around your stomach with an at-home HIIT workout. Incorporate a HIIT workout in your regular routine. HIIT workouts induce "EPOC" or excess post-exercise oxygen consumption, increasing your energy output and thus boosting your overall calorie expenditure up to 15 percent more than steady state exercise. Jog in place for one minute to warm the body up and get the blood flowing through your body. Complete 1 minute of burpees by standing with your feet underneath your hips. Bend your knees and place your hands down on the ground next to your feet. Take a big breath and jump your feet back to a push-up position. Perform a push-up by lowering your body down to the floor so that your chest touches the ground. Rise back up to the top of your push-up position. Jump your feet to your hands and stand up, finishing with a jump in place. Follow this by 30 seconds of rest. Complete one minute of jumping air squats. Start with your feet shoulder width apart. With a proud chest, send your glutes back as you squat down so that your thighs are parallel to the floor. Drive out of the bottom of the squat and explode up into the air and jump. Follow this by 30 seconds of rest. Complete one minute of tuck jumps. Start with your feet hip-width apart. Slightly bend your knees and hinge at the hip as you dip down and drive off of the ground, jumping straight up and bringing your knees up as high as you can. Hold your arms out in front of you to bring your knees up to your arms. As you land, try to rebound as quickly as possible. Follow this by 30 seconds of rest. Repeat steps two through four again for a fat-burning, full-body workout in just 10 minutes. You don't have to do this workout daily -- just three to five times per week suffices. On other days, use the 10 minutes to do a brisk walk or jog to stay active.